Young Justice Superboy Child Costume.Includes: Jacket with attached muscle chest and mask. Available Size: Child - Small, Child - Medium. (See Size Chart For More Information) *Pants and Shoes Not Included. Accessories Sold Separately. WARNING!! 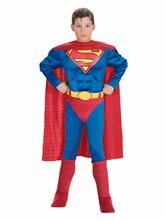 : Keep away from fire.Boys can join the DC Comics superhero team of teenaged heroes with our Young Justice Superboy Child Costume. As a younger version of Superman, kids can grow into their superhero powers during dress-up play. Our kids' Superboy Costume from the Young Justice TV cartoon includes the brown jacket with attached black muscle chest shirt with red S crest logo and the Superboy mask. The Superboy Mask is secured to the face with an elastic strap and features eye holes for easy vision and breathing holes. Your little superhero will take on the bad guys in his own adventure with our Young Justice Superboy Child Costume. 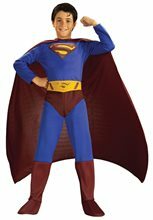 Superman Child Costume; Jumpsuit with attached cape and boot tops & belt. 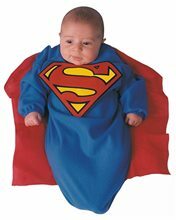 Deluxe Superman Muscle Chest Child Costume; Includes: Muscle Chest jumpsuit, cape & belt. Material: 100% Polyester, exclusive of trim. 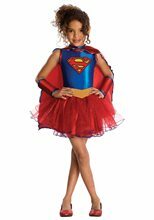 Deluxe Supergirl Child Costume; Deluxe Supergirl Child Costume with attached cape, boot tops and belt.